While Mozilla has been showing off features from its new HTML5-powered operating system for a number of months now, developers looking to create apps and services for the OS have needed to load the software on their own devices. Today, Mozilla has announced its first developer preview phones, in collaboration with “open source” mobile telephony specialist Geeksphone. 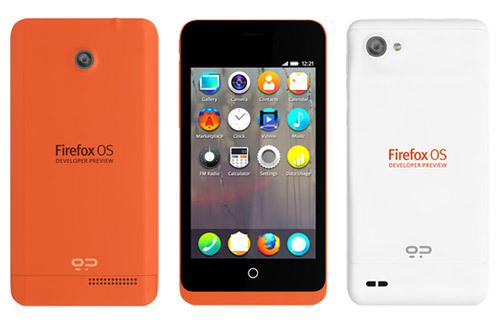 The devices — named Keon and Peak — are developed by Geeksphone and Telefonica, will not be representative of what consumers can expect when FirefoxOS reaches the market but will provide developers with dedicated hardware on which to create, test and deploy apps, widgets and services that will can run on the new open source operating system. The Keon features a 1GHz Snapdragon S1 processor, 4GB ROM and 512MB RAM, a 3.5-inch HVGA display, 3-megapixel camera, MicroSD support, a 1580 mAh battery and support for 2G and 3G networks. Remember, this isn’t a consumer device, so the specifications will be somewhat limited. The Peak is more powerful and feature rich, offering a dual-core 1.2GHz Snapdragon S4 processor, 4.3-inch qHD IPS display, 8-megapixel rear-facing camera (2-megapixel front), 4GB ROM and 512MB RAM and a 1800 mAh battery. Mozilla announced development of FirefoxOS back in early 2012, with the support of some of mobile’s biggest operators, including Deutsche Telekom, Etisalat, Smart, Sprint, Telecom Italia, Telefonica and Telenor, each of which is backing the open FirefoxOS as a new entrant to the smartphone marketplace. Mozilla plans to launch a fully open mobile ecosystem built on HTML5. Device manufacturers TCL Communication Technology (under the Alcatel One Touch brand) and ZTE have revealed that they will manufacture the first devices to feature the new FirefoxOS, using Snapdragon processors from Qualcomm (like the developer device announced today). ZTE continues to work on its FirefoxOS device, and is said to be mulling a US launch also. The first FirefoxOS powered devices are expected to launch commercially in Brazil in 2013, through Telefonica’s commercial brand, Vivo. The FirefoxOS will be built on Mozilla’s Boot to Gecko project, which attempts to enable HTML5 applications to access the underlying capabilities of a phone, e.g. the camera, previously only available to native applications.